OR £38.45 per week 0% APR ? 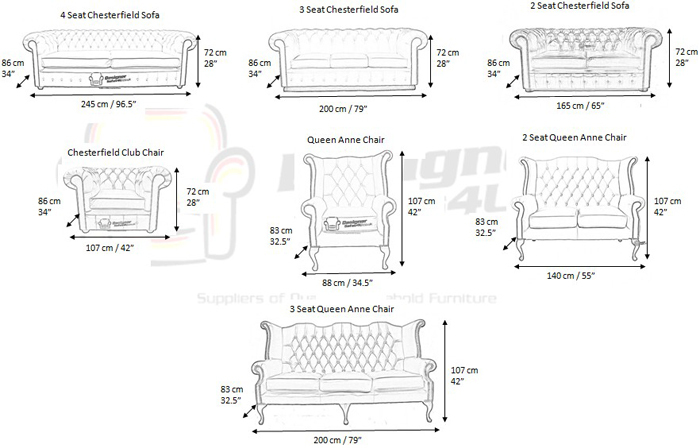 The Chesterfield Classic Suite available in 3 + 1 x Mallory Wing Chair + 1 x Queen Anne Wing Chair+­footstool (Three Seater Settee + Queen Anne Wing Chair + Mallory Wing Chair+­footstool). The Chesterfield Leather Sofa with it's unique Low Back Style, Deep Buttoned Arms and Back complemented with a Buttoned Front Border. The Scroll Fronted arms on the Chesterfield Leather Sofa are attractively embellished with lines of individual stud nails. An undoubted winner in any room from the cottage to the boardroom. A classic of its kind Traditional Vintage British Style. For a rough guide to the cost of Worldwide Shipping please click here. Delivery Lead Time 2-4 Weeks - normally orders are delivered to your door within 3 Weeks of ordering! If you require more information on this piece of furniture, please feel free to contact us on: Tel: 01254 268590. Alternatively click on the LIVE HELP button located in the 'Top Right' Hand corner of your screen. Our showroom opening times are Monday - Friday 10am - 5.30pm.